With FDI, rather than frowning, small retailers can learn and upgrade themselves. Indian retail arena has been giving out mixed reaction over the FDI policy being approved. The industry is divided in to two with one part saying that it will impact adversely the operations of small retailers while the second section thinks that the two can co-exist and operate parallel to each other. The FDI policy has come as a boon for the retail industry as it would strengthen investment in the market, better supply chains and IT. But on the other hand a few frown for the fact that it would lower the importance and existence of homegrown brands and small retailers. The Indian retail market stands at $450-billion retail market, of which organised retail accounts only 5 per cent which means that $427.5 billion is controlled by the unorganised retail. This segment can never lose upon their market share even if foreign investment pours in Indian market. The small retailers are generally the neighbourhood shops. These shops can never go out of fashion with consumers as they are easily approachable, give value for money and also give a more personalised experience, which we as Indians love. Moreover, coming of international players would only mean a healthy competition which would push the small retailers to upgrade themselves. The purpose of both remains the same: to offer customer satisfaction. The small retailers would upgrade themselves in terms of visual merchandising, inventory, stocking, services and technology to maintain all of these. We have seen small retailers upgrading themselves with better technology including POS and inventory management; offering services including free home delivery or taking orders over phone and having a wider product range with more brands in each product category. According to Montek Singh Ahluwalia, Deputy Chairman of the Planning Commission, the central point is, in a growing economy, if we have to achieve our objective of 8 per cent growth, in that kind of growth scenario, the total size of the retail market is going to be more than double in a very short time. The chairman of the Prime Minister's economic advisory council (PMEAC) Dr C Rangarajan is of the view that it has been observed internationally as well that with time small retailers will be washed off with the expanding large format retailers in the market. He believes that with the growth that is being foreseen for modern retail, once this number is reached at 25 percent – 35 per cent the impact would be seen at kirana stores as their sales will squeeze. The modern retail offers better services in a more organised manner and also offer loyalty programmes to consumers which keeps them engaged and coming back. The modern retail is surely set to see a boom with FDI and the impact to be seen; only time will tell. 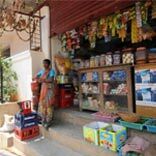 The Indian retail scenario is still different from other international markets, as people find the neighbourhood shops better even with modern retail cropping up.